Samuel Peploe was baptised in Dawley on 29th July 1667, the son of a yeoman farmer. He was educated at Penkridge School and Jesus College, Oxford where he matriculated as a commoner, subsequently gaining his BA and MA. Once he had taken holy orders, his promotion through church ranks became rapid. 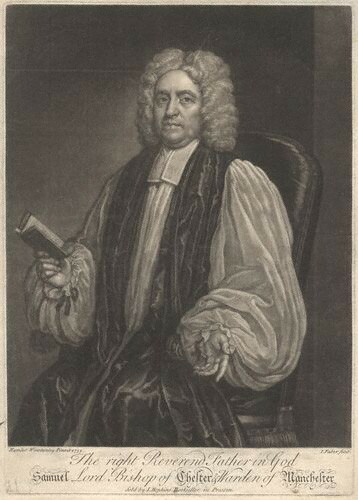 In 1695 he was rector of Kedleston in Derbyshire, and in 1700, vicar of Preston. Peploe was known for his strong anti-Catholic views in what was a largely Roman Catholic population, but his religious convictions and his Whig and anti-Jacobite politics made him attractive to his patrons at Preston. When Jacobite forces entered Preston in 1715, Peploe ‘mounted his pulpit’ and urged his parishioners to support the newly established Hanoverian King George. It was this act of courage, his loyalty to the crown, but above all his uncompromising sermons identifying the dangers of ‘popery’ which brought him to the attention of ministers, and probably secured his promotion to the vacant wardenship of the Collegiate Church of Manchester. This was an influential post but his induction was refused for years because his bachelor of divinity, conferred at Lambeth, was deemed invalid by his diocesan, until the situation was resolved in his favour in 1725. The post of bishop of Chester became vacant in 1725 and Samuel Peploe’s success was noted mostly as due to his ‘zeal and affection to the true interest of our king and country’. He was consecrated on 12th April 1726. Over the next twelve years he proved a determined, combative individual in the defence of what he believed, eventually establishing a Whig majority at the cathedral, working to set up charity schools, founding the town’s blue coat school, and never allowing the rich to forget their Christian duties towards the poor. He was a staunch Anglican, but not a zealot, except perhaps in his opposition to Roman Catholicism, including his rejection again of the Jacobites in 1745. The bishop was appreciated as a great defender of the church against its detractors, and also for the conscientious exercise of his duties. Samuel Peploe married twice, with a son and four daughters by his first marriage. In later life he suffered poor health. He died in 1752 and was buried in Chester Cathedral where a memorial to him was placed on the North Wall of the building. • He consecrated 39 churches and chapels throughout his diocese as well as having built 2 new galleries in the choir of Chester Cathedral. • He was a staunch Anglican, but not a zealot, except perhaps in his opposition to Roman Catholicism, in what was a largely Roman Catholic diocese. • He never allowed the rich to forget their Christian duties towards the poor. This was somewhat ironic as he himself had reputation for meanness. • He married twice and had 5 children. His only son, also called Samuel, became Archdeacon of Richmond. • He died in 1752 and was buried in Chester Cathedral where a memorial to him was placed on the North Wall of the building.